Sponsored Post: I am being compensated by Lunchbox in partnership with Walmart and Simple® facial wipes for this post. All thoughts and opinions are my own. Affiliate Links: If you click on a link in this post, I may make a very small commission. Looking ahead to spring and summer, I’ve already been on a few weekend getaways, and we have some longer trips planned that call for some serious packing. And it never fails, I almost always forget something vital in my beauty routine and then I suffer. Anytime I’m traveling by airplane I absolutely need gentle cleansing wipes or cleanser. And when I’m going somewhere warm, of course, I need some sunscreen. I almost always forget one of these things and then am stuck using whatever the hotel provides or what I can grab at the drug store. Yikes. Nothing is better to have on hand than a good packing list! 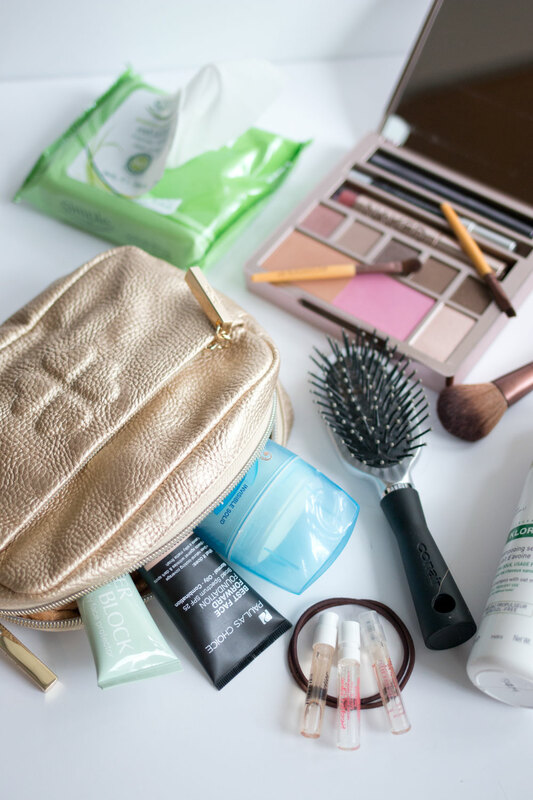 I’ve gathered my ten travel beauty essentials at a time when I’m NOT actually packing. 1. Mini Brush: Packing a full-size brush is such a pain because it rarely fits in my makeup bag, and I’d prefer to not get stray hairs all over my clothes in my suitcase or duffel. I travel with this mini brush, and the rest of the time it stays at work for those times my hair gets a little cray. 2. Hair Tie: An obvious one, but I’ve forgotten to pack these more than I’d like to admit. I always pack a few just in case one of the elastics snaps. P.S. 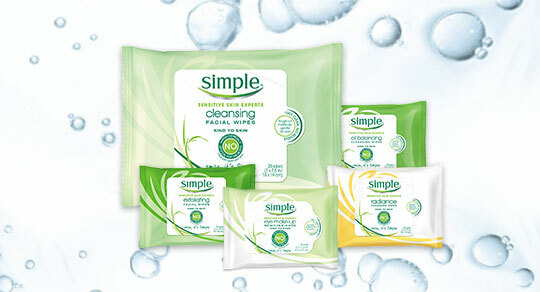 Right now Walmart is offering a free 7-pack of Simple® wipes with the purchase of a Simple® cleanser or moisturizer in stores! Score. 4. Makeup Palette: If you’re tight on space, the Naked On-the-Run Palette ($54) really packs a punch. It contains eyeshadows, blush, bronzer, and even has tray slots for an eyeliner, mascara, and lipgloss. Plus, the matte eyeshadows double as brow powders so you can skip packing brow products if you want. If you’re on a budget, this NYX Jersey Couture Palette ($20) or the Smashbox Minibox Kit ($29) are both great options. 5. Your Favorite Foundation: Learn from my mistakes, going on vacation is NOT a time to pack a travel size you got in an old Birchbox or Ipsy bag. I packed a couple from old boxes that had SPF for my Bahamas trip, and they were way too dark since it was the middle of winter. I felt kind of dumb, but at least I didn’t burn my face? 6. Sunscreen: If you have the potential to get burned, pack a nice sunscreen. The worst is forgetting to pack one and having to run to the drugstore to get whatever they have on hand. It’s nice to be able to pack one you can count on! 7. Travel Makeup Brushes: I bought EcoTools Mini Essentials Set, and I keep them in my work bag all the time. If you’re tight on space and can’t pack all of your brushes, a travel set is a great option. 8. Fragrance Samples: I would never risk breaking an entire bottle of perfume, so I always pack a few of the sample vials I get in my Sephora orders. Plus, who doesn’t like trying a new fragrance? 9. Dry Shampoo: This is a staple for me since I don’t wash my hair every day. I get greasy near the scalp, so a little spray or 10 of dry shampoo makes it all better. What are your travel beauty essentials? Anything you’d add or remove from this list? I’ve seen those Simple face wipes and wanted to try them! That Naked palette looks perfect! *heart eyed emoji* Thanks for sharing! Of course, the Naked on the Run is amazing for travel, and the Simple wipes are my favorite. Highly recommend both! Great list! Those wipes are a life saver and I’m loving that makeup palette! That’s a great idea, I should do the same! I always over-pack when I travel, including my ‘beauty bag’. When it comes down to it, all I need is a hair tie, leave in conditioner, sunscreen, concealer, mascara and lip gloss…and lots of water. OK, I’m going to add natural aloe gel because, if there’s sun, my skin always goes a little red. Oh Aloe is a great addition! I got burnt in one spot last vacation and definitely had to make a stop to Target for some to relieve the pain. This is a great list! Those face wipes look great. I have to admit I often forget a hair-tie and brush. Funny how things can slip your mind. Thanks! Yes, isn’t it funny the things that get forgotten when packing? I have a little collapsable makeup powder brush from Sephora that I LOVE. It has a cover for the hairs, so they don’t get all dirty rolling around lose in my makeup bag. 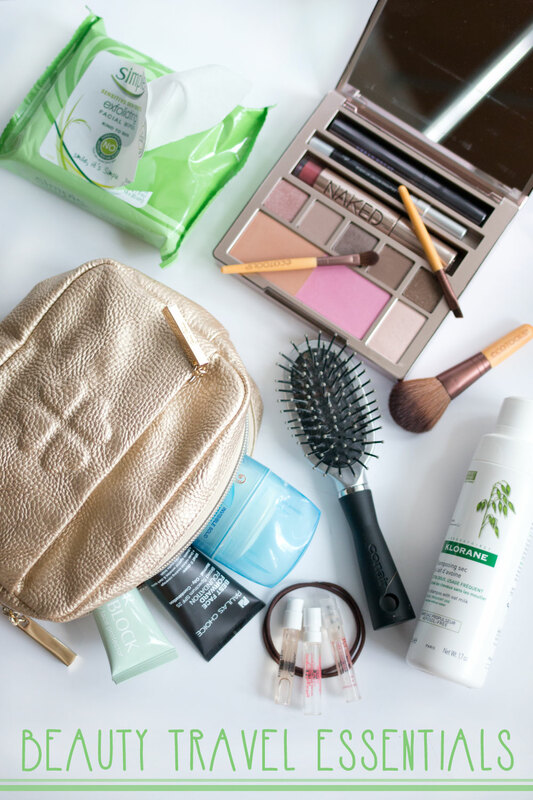 I also agree that dry shampoo and wet wipes can be a lifesaver – I even use those regularly when I’m home! So I don’t have to style my hair a lot during vacation AND not have to bring all of my hair essentials, I also bring dry shampoo. Just started using Oscar Blandi dry shampoo and I am in LOVE. A little goes a long way AND it smells great! That makes sense! The one I used from Oscar Blandi was an aerosol as well. I’ll have to try the powder version… $15 is a great price! Fragrance samples are definitely a good idea. I’d rather only have 2ml of something leak in my bag than a whole bottle! I know right? I always try to pack them in a small plastic baggie just in case they leak too! I’ve been looking for some good face wipes for a while, these look great! I hate eye makeup remover and hate washing my face even more, face wipes are my favorite ;) Thanks! The Naked palette looks lovely. I have their eyeshadow palette and love it! I don’t go anywhere without dry shampoo! Such an essential. :) I also love the palettes, I have a Jane Iredale one that is very similar to the Naked palette. I’ve heard great things about Jane Iredale, I still have yet to try the brand out! I’ll have to check out the eyeshadow palette. Great list! and such a good idea to make it before you actually need to be packing. That way you know you haven’t missed anything- I hate when that happens! Thanks Stephanie! So do I! Also a nail file! I can’t tell you the amount of times I’ve chipped a nail when I’ve been traveling and can’t do anything about it until I get home. This is a great roundup of items for sure. I haven’t tried alot by simple yet. But I did buy the cleansing water and I think I need to get those wipes. I am a huge makeup wipe person especially when it comes to travel. Great tips ! Thanks Jamie! I haven’t tried the cleansing water but will definitely have to grab it next time I’m at the drugstore! Love this post! A mini brush is a great idea… I never think of stuff like that haha. And then I end up leaving my real brush in a hotel somewhere. Thanks Shannon! Oh no, that’s the worst! 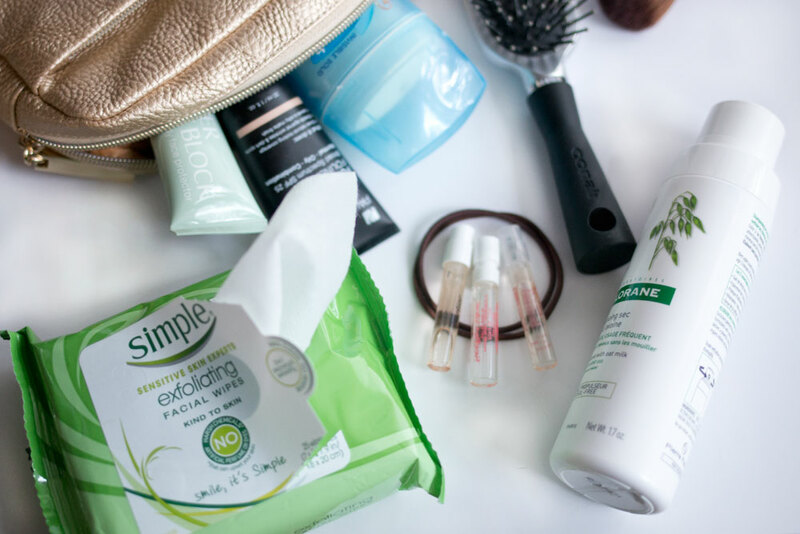 love the simple wipes – they are my next favourites after the neutrogena ones.